The leading argument against the killing of California sea lions that feast on endangered fish at Bonneville Dam is that the lions eat a "mere 4 percent" of the salmon and steelhead swimming upstream to spawn. Well, yes. But Northwest electric ratepayers and federal taxpayers spend upwards of a billion dollars a year in a desperate effort to restore these fish. And they spend much of this money on salmon restoration measures that promise much less than a "mere 4 percent" return of chinook salmon. One way or another, the dozens of sea lions that now habitually swim up the Columbia River and spend the salmon migration lounging around the fishways at the base of Bonneville, snapping up endangered salmon, have got to go. The region has spent years trying to avoid killing them. Nothing else has worked. Not firecrackers. Not hauling them away. Not rubber bullets. More and more sea lions keep showing up at Bonneville, eating and eating and eating. Today there are more than 300,000 California sea lions along the Pacific Coast. There were only 10,000 sea lions when Congress approved the Marine Mammal Protection Act of 1972. We know that sea lions are not to blame for the demise of Columbia salmon. The fish runs collapsed because of dams, overfishing and habitat destruction. Even today, these are more significant causes of salmon mortality than sea lions. But we also know that the Northwest has no choice now but to address every killer of wild salmon. Besides, the impact of sea lions on some endangered stocks is greater than the 4 percent figure suggests. That figure is based on the share of all the salmon passing through Bonneville over an entire year. In fact, the sea lions are at Bonneville only a few months, and their impact is much greater on those stocks migrating in spring. NOAA Fisheries has estimated that removing 85 sea lions a year for two years could increase the returns of listed spring chinook and steelhead by up to 12.5 percent, a much higher return than the region would get from expensive improvements at dams. Sport fishermen targeting hatchery fish, not endangered wild species, are allowed about 13 percent of the salmon run. Sport fishing, meanwhile, provides hundreds of millions of dollars in annual economic benefit up and down the Columbia. The region can't, and won't, keep feeding endangered salmon to the lions while demanding that sport fishermen stop catching hatchery salmon. Yes, it is sad and disturbing to kill one species to save another. Yes, it is easier to rail against the dams, even though the region's economy utterly depends on Bonneville and other dams. 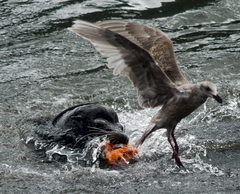 But there is that mere 4 percent, thousands of returning adult salmon, eaten by sea lions. The hard reality is that there is no free lunch on the Columbia, not for anyone or anything.